The Oscars aired this past month, and the big winners were Eddie Redmayne for playing a man with ALS, and Julianne Moore for playing a woman with early-onset Alzheimer’s. The former disease traps a person in their body but leaves the mind intact; the latter keeps the body working for the most part but destroys the mind. Both highly intelligent people, both characters would probably prefer to keep their minds over their bodies. Our minds are who were are, distilled to our very essence. The thought of losing that is terrifying. Like Julianne Moore’s character, Nora Glass in Rachael Herron’s Splinters of Light is diagnosed with early onset Alzheimer’s in her mid-40s. Nora is a newspaper writer with a 16-year-old daughter, Ellie; a fraternal twin sister, Mariana; and a neighbor, Harrison, who has been a best friend for 15 years and now suddenly there’s something more. But this diagnosis changes everything. Now, instead of looking forward to Ellie’s college search, exploring the relationship with Harrison and spending more time with her sister, Nora is faced with the end of her mind, and then the end of her life. Not surprisingly, she puts off telling her loved ones as long as possible. Splinters of Light employs three points of view – Nora’s, Ellie’s, and Mariana’s. Nora’s is the dominant one, and although the book is written in third person, Nora’s terror as her mind slips away is clearly conveyed. Ellie’s dilemma, as well, is understandable – she’s at the age when she’s supposed to pull away from her mother, but how can she while Nora is also slipping away? For Mariana, faced with losing the person she’s closest to in the world, her conflict is more specific. With Ellie’s father basically out of the picture, Mariana sees herself taking care of Ellie when Nora no longer can … but Nora has always viewed Mariana as a screw up, and Nora’s disease makes it impossible for her to hold her tongue about her twin’s shortcomings. Simply put, Nora just doesn’t think the “fun aunt” is mature enough to finish the job of raising her daughter. The dynamic among these three women is just as important as the disease angle, and helps make the book much more than the Lifetime movie it might have been with cardboard characters. All three women are very specific people with their own relationships and passions that make them come alive on the page. The only aspect of the book I did not appreciate was the author’s inclusion of Nora’s newspaper columns about Ellie. Titled “When Ellie Was Little,” Nora used them to recount anecdotes from Ellie’s childhood, such as the time they had pizza for Thanksgiving. Nothing in these columns was terribly special or unique, and the author doesn’t really follow through on companion pieces Nora attempts to write to give advice to an older Ellie. The book would have worked just as well, if not better, without them. When you pick up a book like Splinters of Light, you know there’s not going to be a happy ending. Rather than rooting for a couple to live happily ever after, the reader has to decide what outcome she wants to see. Should Mariana marry her boyfriend and raise Ellie? Should Nora marry Harrison? Should Ellie pursue her dream of attending college on the other side of the country, or stay close to Nora? What about Ellie’s father? I had my own preferences, but others reading this book may want different outcomes. Unfortunately, there’s no changing what’s ahead for Nora. 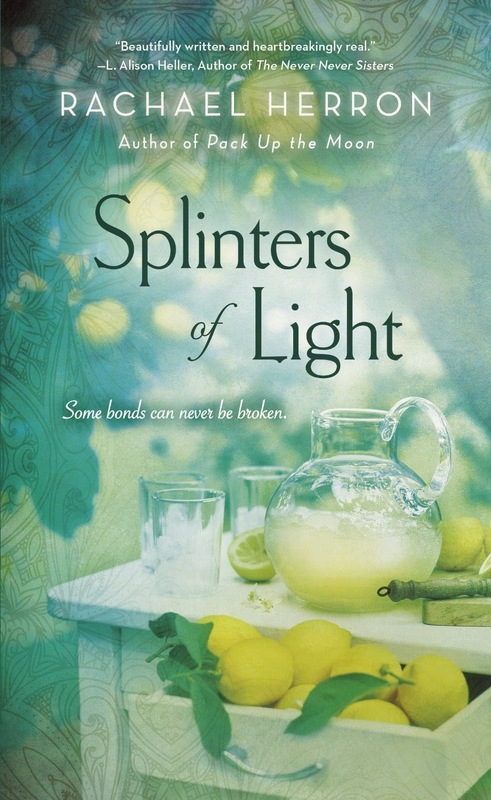 Splinters of Light is a very well-written book, but I wonder if you can call a book like this “enjoyable.” We don’t read books like these for a fun experience … we read them to see characters facing their worst nightmares, hoping that they find grace before the end. They are not happy stories, but they can be inspiring ones. Pinning that book cover for later - it sounds good!